“Summer is Icumen In” and you stare out at your back yard in despair. It’s no place for a family who can’t wait to get outdoors to enjoy the brilliant weather. But wait a minute, with some work and a little endeavor you could turn your backyard into a summer oasis where you can spend quality time with family and friends. Here are some suggestions for realizing that dream. 1. Aim For Low Upkeep. Most people like to keep yard work to a minimum. Use mulch to control weeds or consider spreading wood chips. Position weed blocker prior to laying paving stones. Prior planning will reduce chores and enhance enjoyment of your retreat. To avoid the need for constant pruning, select shrubs that will grow to the height you want. Settle for plants that are compatible with the amount of sunlight they will naturally acquire – be sure to make mother nature your ally not your enemy. If space is at a premium be prepared to multi-task. The cooking area with a cast iron glider bench for several people, some matching chairs, or a porch and hammock swing, quickly becomes a chat room for the whole family to interrelate. Include a portable fire pit as a focal point and indoor rooms become redundant. 3. Food Is For The Body; Flowers Are For The Psyche. Decide whether you wish your garden to be practical or attractive. A simple vegetable patch will supply valuable nutrition. Or maybe you fancy a cutting garden full of vibrant flowers - easy-to-grow favorites are cosmos, sunflowers and zinnias. Children, on the other hand, favor plants that grow quickly – pumpkins, squash and cherry tomatoes. It is essential to cater to everyone’s tastes so that the whole family can enjoy their own space. Construct an appealing spot where you can savor morning coffee while reading the newspaper. Make a space to play board games by putting in a small table with chairs. Fashion an inviting alcove with a wooden chair swing for those who love to read. And, remember, kids love hideaways – a strong tree would be the perfect place for a tree house. If there’s sufficient space, a miniature garden train will add an extra and entertaining dimension to the backyard. Garden trains and tracks are weather proof and can survive the elements. Each member of the family can allow their imagination free reign during landscaping the layout of the track. The atmosphere of gatherings with family or with special friends, can be enhanced by music. Purchase outdoor speakers fabricated to resemble rocks and position them alongside pathways, or place your own speakers discreetly in trees - this sustains the natural appearance and adds to the ambience. A water feature is indispensable; a birdbath or fountain to provide sounds which mask the daily clamor and soothe the psyche. And why not make space for a hot tub, a divine place to relax after a hard day. Quality furniture will pay a dividend of many years of pleasure. A well placed bench can change an empty part of the yard into a place of quiet reflection. A hammock can be slung between shady trees or affixed to a stand for napping in the sun. A quality porch swings stand set becomes a perfect spot for taking time out during a hot afternoon or for staying dry during a rainstorm. Let your artistic self run free with paint colors, wood finishes, and cushion patterns. There is enough license to turn your retreat into a creative masterpiece. Fix your family’s meals on an outdoor grill where the fireplace immediately becomes a focal point ands extends your retreat’s functional time. A portable fire pit gives you flexibility of setting and is superb place for a cook out – hot dogs or roasting marshmallows. Make space for family games. 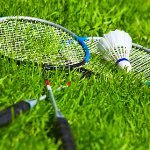 Badminton requires only a small clear area while a strip of sand can make a fine location for a game of horseshoes. 10. Build Upon The Existing Features Of Your Yard. beginning. Record the site of trees and shrubs and which areas are usually sunny and/or shady. Then make a plan to improve on what you already have. A coat of paint can restore a patio/porch. The severe outline of a chain link fence can become a feature of splendor by the addition of ivy or morning glory. Even overgrown shrubs and trees can be trimmed down to ripe finery. Planting a close packed hedge will guarantee your privacy and at the same time absorb unwanted sounds. And evergreens will ensure your year round seclusion. With the implementation of some of these ideas, your backyard can become a favorite space for everyone. Jay Chua is the Publisher of PorchSwingSets.com. He is a nature aficionado and garden guru. When he is not gardening, designing backyard sanctuaries or traveling, he relishes peaceful times spent on his wooden chair swing or porch and hammock swing at his home in Vancouver, Canada with his wife, Deisy. To make your own carefree memories, visit PorchSwingSets.com to explore a range of patio swings made with your very own backyard oasis in mind. Visit his blog for ideas on quality patio furniture and more! Click Here!